This column is losing what little reputation it had. 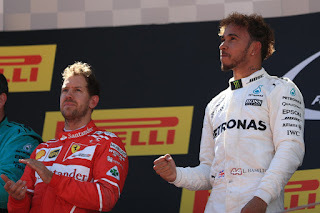 In Monaco I backed Lewis Hamilton to win and we got Sebastian Vettel. In Canada? Yes, you guessed. And this one in Azerbaijan is far from safe ground to strike back. As in advance it looks a very close call between the usual suspects Ferrari and Mercedes - or more to the point between Vettel and Hamilton. This is reflected in the odds, with Lewis even money to win this Sunday and Seb 2/1. Prior to Montreal we felt safe in assuming that this street track in Baku was the sort to trip up Mercedes in 2017 - low grip, slow turns... But in Montreal as the opening paragraph intimates Merc surprised us by taking a one-two on precisely that type of circuit. This weekend much will hinge on whether the Brackley squad has indeed had a eureka moment, or whether Canada was a one off. Adding to the confusion, last year in Baku Lewis on Friday looked set to dominate - which made sense given it's an acrobatic track that rewards bravery. But after that he went on to have one of his off weekends. A relatively high average speed and the non-appearance of the ultrasoft tyre may tilt things Merc's way though. Mercedes tends to be on top in qualifying too (Lewis can be backed at 7/5 for the pole, which looks great value) putting it in position to control the race, and only one in-race stop is likely. You may also be tempted to back Lewis to top Practice One, at 5/6, as he's been quickest in the last three such sessions. Sadly the bookies appear finally to be twigging on Force India's fine form, and that the slippery Silverstone car should go well on this track - Sergio Perez indeed set second best quali time here last year and finished the race in third despite a grid penalty. Therefore Checo is a rather swingeing 4/7 to finish in the top six this time but as a longer range punt you can get 10/1 on him to repeat his podium finish. Also Esteban Ocon, who in the other Force India has been going pretty much toe-to-toe with Checo lately, is a reasonable evens to finish in the top six this Sunday. Perhaps we also need to think more broadly. Last year in the sport's inaugural Azerbaijan visit we expected a lottery - many crashes, trips down narrow escape roads, safety cars, plenty of overtakes in a generous DRS zone etc etc... Almost none of it happened in the event, which some attributed to the constrained conversation formula of the time. Now though drivers are required to push. It may be the betting value lays in assuming a crazy race. If safety cars are indeed to be aplenty - and therefore bunch the field - a race winning margin of under five seconds can be backed at a valuable looking 6/5. And what of unusual suspects getting a top ten finish? Perhaps Sauber is most apt, as its Ruth Buscombe-inspired speciality is to plan to take advantage of such disruption with stretched-out strategies, and indeed Pascal Wehrlein finished eighth in Spain with something like this. He can be backed at a fat 14/1 to score again this time. All odds quoted in this article were accurate on the Oddschecker website at 1900 GMT on Wednesday 21 June 2017.